1. Preheat a fan-forced oven to 210°C and line a large baking tray with baking paper. 2. Place onion into a blender and blend until finely chopped. 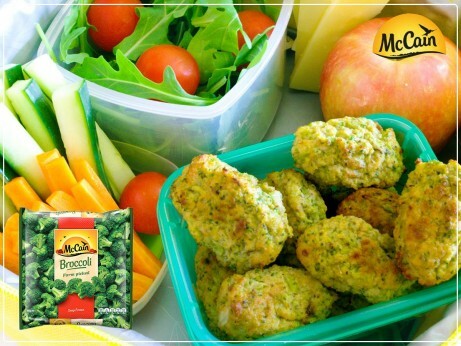 Add McCain Broccoli and blend until chopped into small pieces. NOTE: this can be done with a knife if you don’t have access to a blender. 3. Transfer the broccoli mixture to a large mixing bowl, add remaining ingredients, mix until well combined, and season to taste with salt and pepper. 4. Take a tablespoon sized scoop of the mixture, and use your hands to form into small patties. Place onto the lined baking tray and repeat. This mixture will yield approximately 25 Broccoli Tots. 5. Place the Broccoli Tots into the oven and cook for 20 minutes, turning halfway, or until golden. Serve immediately or pop into a lunchbox for a healthy school or work snack! 6. May be stored in fridge in an airtight container for 3 days or kept in freezer; just microwave till hot and enjoy! 1 Preheat a fan-forced oven to 210°C and line a large baking tray with baking paper. 2 Place onion into a blender and blend until finely chopped. 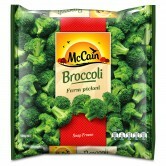 Add McCain Broccoli and blend until chopped into small pieces. NOTE: this can be done with a knife if you don’t have access to a blender. 3 Transfer the broccoli mixture to a large mixing bowl, add remaining ingredients, mix until well combined, and season to taste with salt and pepper. 4 Take a tablespoon sized scoop of the mixture, and use your hands to form into small patties. Place onto the lined baking tray and repeat. This mixture will yield approximately 25 Broccoli Tots. 5 Place the Broccoli Tots into the oven and cook for 20 minutes, turning halfway, or until golden. Serve immediately or pop into a lunchbox for a healthy school or work snack! 6 May be stored in fridge in an airtight container for 3 days or kept in freezer; just microwave till hot and enjoy!